The Santa Cruz Mountains Challenge is a great event leading over ridgetops and through the redwood forest of Santa Cruz County. In addition to a challenging century, a metric and double metric century route is available. The century route consists of a big, counter-clockwise loop connected to a smaller, clockwise loop. 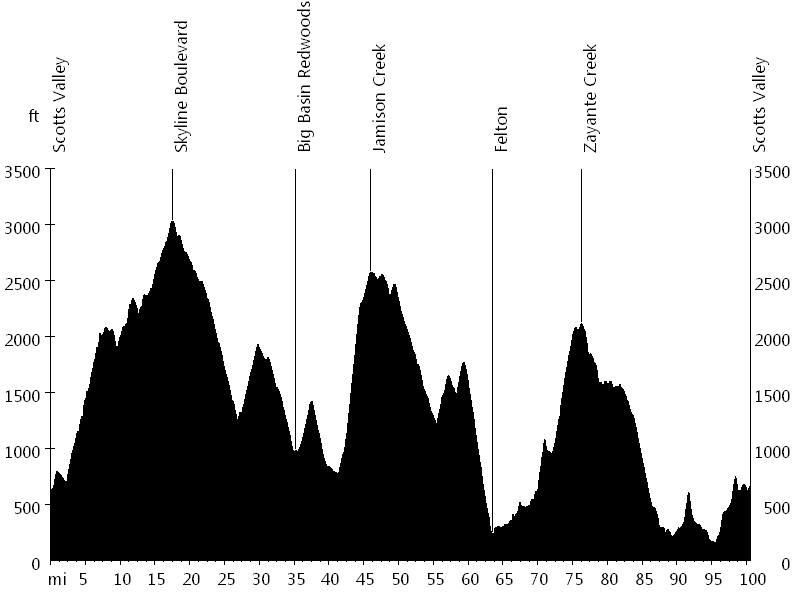 The ride starts in Scotts Valley, located in the coastal mountains between San Jose and Santa Cruz. After a short warm-up on Glenwood Drive, climbing begins in earnest on Mount Charlie Road. 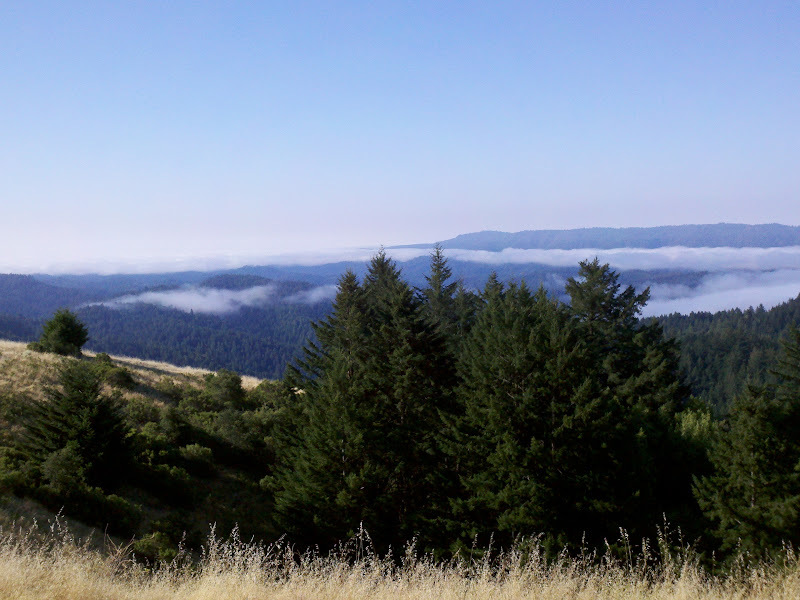 Then Summit Road, Bear Creek Road, and Skyline Boulevard lead along a ridge, before Big Basin Way drops down into stunning Big Basin Redwoods State Park. Next Jamison Creek Road, a timed hillclimb, heads up steep switchbacks to Empire Grade, before Pine Flat Road and Bonny Doon Road drop down again. Martin Road leads up to Ice Cream Grade and Felton Empire Road down into Felton. 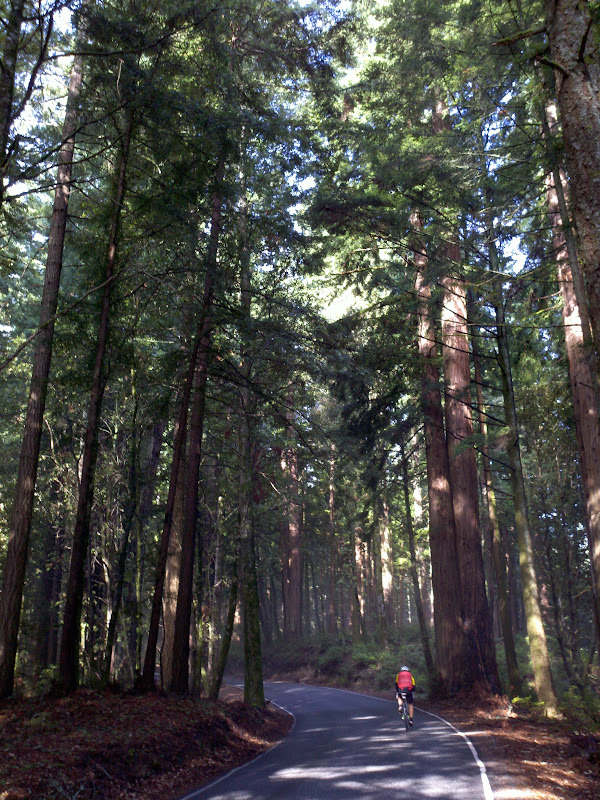 Then Zayante Road climbs back to Summit Road, completing the first loop. After following the ridge on Summit Road and Old Summit Road, Soquel San Jose Road descends, and Laurel Glen Road, Mountain View Road, and Branciforte Drive continue on. Finally Granite Creek Road ascends to Scotts Valley, completing the second loop and century route. Sandra and I went a few days to San Francisco while Lisa was studying in Berlin, Germany, for the summer. We met up with some runners from Puebla, Mexico, and Sandra participated in the marathon. To get in exercise myself, I went to Scotts Valley for the Santa Cruz Mountains Challenge. At the lunch stop I met Emil S. from Switzerland, who studied at my alma mater a generation before me, and we rode together. Thanks a lot to Santa Cruz County Cycling Club and all volunteers for the great event.